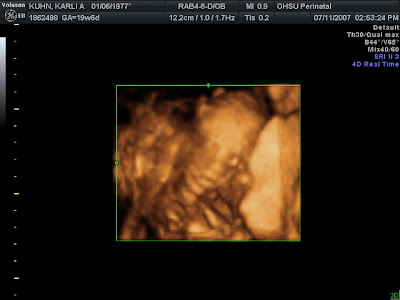 Here is Samuel's 20 week 3D ultrasound photo with our new baby's photo right below. They look quite similar, don't they? Finally got the last of the coreopsis in the ground today. I bought five coreopsis plants over the weekend. It's not too hot today, thank-goodness! Tonight, we're heading to a concert (and dinner) in the park. I can see the similarities. 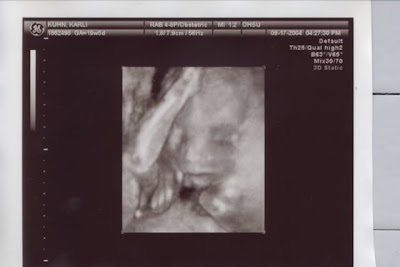 It's so fun to compare and try to imagine what another child of yours will look like. The u/s's are cute! You look great btw! And thanks for coming over yesterday. It is very fun to see!! Yes!! I do think they are similar and I can tell they both have the same Mommy and Daddy -- and big brother!!! AND~~~ Nana!!!! AND~~ Papa!! !